I had a writer comment about these shoes... they were "incredibly bright yellow" and with "absolutely no support." The Air Huarache line had several models, and it has its own page. This model was interesting in that it had a separate slot for the big toe. Nike made special socks just for the Air Rift. 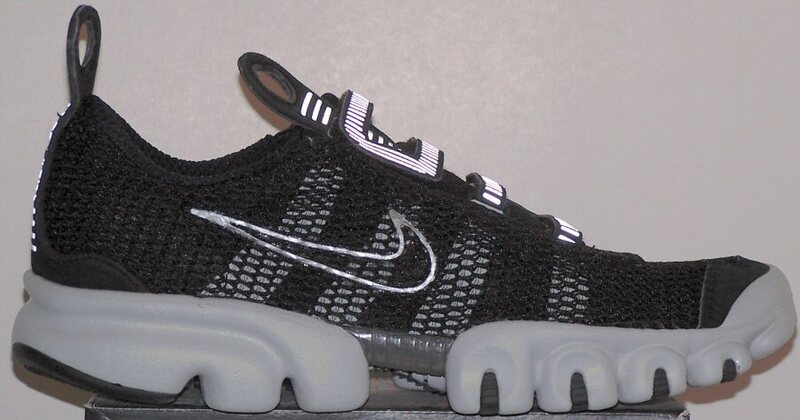 This model had an overall stretch mesh that covered the front of the shoe like a spider web. There were various colorways; the most frequently seen was a blue/white that resembled pool water with ripples. 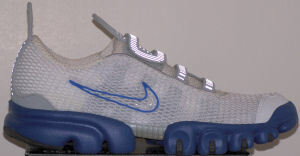 This is the Nike Air Kukini version from 2003. Instead of laces, this design fastens closed with hook and loop fasteners. The back view states "--- Run Hard --- Run Fast ---." If this is advice for the wearer, it's most likely in the wrong place! Other colorways known to exist but not shown here include black mesh with red lugs and gold mesh with black lugs. Nike describes this model as "a T-shirt for the feet." The "Engineered Support Cage" (blue in this model) around the midfoot holds the foot in the shoe. Because of the design, Nike released only six sizes (XXS, XS, S, M, L. and XL), which covered the range from women's size 4.5 to men's size 15. Each Air Presto size covered two traditional shoe sizes. Nike made the Air Presto in many colors, including a "red, white, and blue" patriotic color scheme. Proceeds from this particular colorway were donated to 9/11 relief efforts. In Summer 2005, Nike returned the Air Presto to the Nike line as a NIKEiD shoe. They shipped these really fast... just over two weeks. I was a bit surprised by the return address: Singapore! These shoes, and the ones below them, fell apart quickly. The inside cage broke loose from the rest of the shoe. Another NIKEiD pair shipped from Singapore in just around two weeks. Similar to the Air Presto, except it comes in integral sizes and is a slip-on shoe. Nike advertises this as a lightweight, form-fitting cross-training shoe. That's definitely the case. The shoe features a plastic cup over the heel, with the word "presto" on it. However, despite this, the shoe does not have an "Air Presto" series name. This particular version has a fabric pattern derived from a blueprint of the shoe. 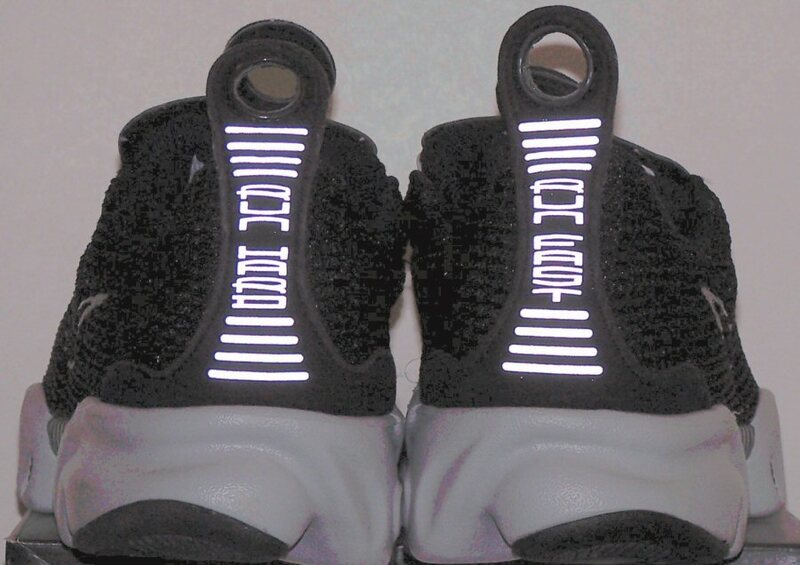 The last two letters of the words "Korea Development Center" end out under the midsole close to the small toe. I was very disappointed when these fell apart after heavy wear for a number of years, because I liked them so much! The Air Trainer Escape was also available as a NIKEiD shoe. Yet another variation of the Air Presto design. This version is a slip-on, with a TPU cage similar to the Air Trainer Escape pictured above. Another cross-training shoe with a support cage. This shoe feels more suited to vigorous activity than the Air Trainer Escape. This example is the Nike Air Presto Chanjo Leather; the vamp is leather, the back is a stretch synthetic fabric. 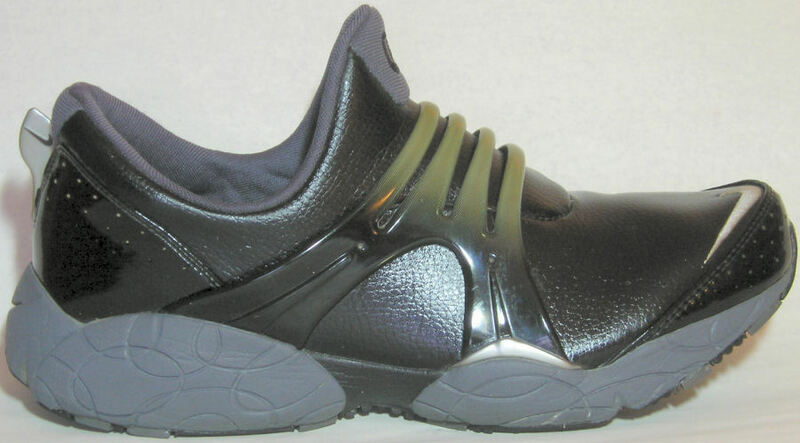 This Presto Chanjo example is all stretch synthetic. 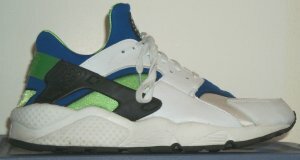 Another cross-training shoe with a support cage. 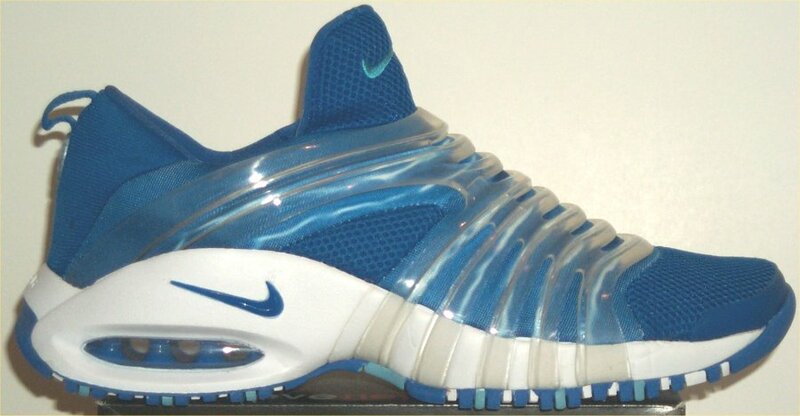 It appears rather much like the original Nike Air Presto.